The best editor helps you easily edit social media videos with powerful features. There are various forms of marketing and the social media marketing revolves around gaining attention from the present and the potential clients. But, the success of social media marketing doesn’t end by posting or sharing a few high-quality posts. You must know when your target users are most likely to see and engage with your post and post accordingly. If you cannot analyse the precise time, your posts would go unnoticed. Therefore, you must find the best time to post on social media in 2019. It is the key to engaging the right kind of people at the right time. Facebook is the most used social networking site with over 71% of the people visiting the site each day. Although the use of Facebook from mobile devices is increasing, it is accessed from both desktop and mobile devices and from both home and other locations. In around 14 markets across the globe, more than a quarter of the Facebook users access it only through mobile. 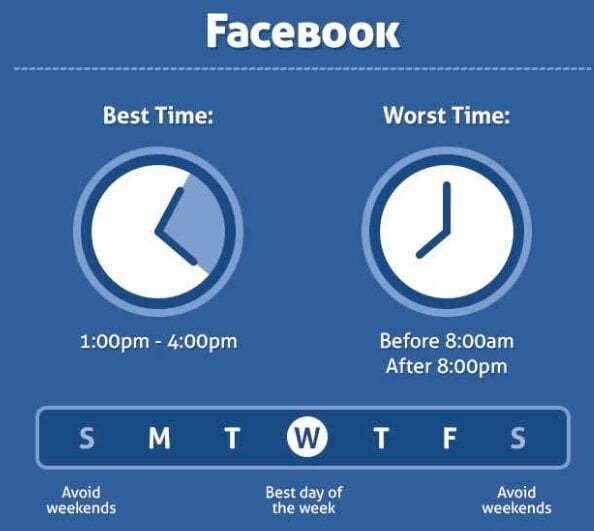 The best time to post on Facebook is on Monday, Wednesday, Thursday, and Friday between 12 p.m. and 3 p.m. During the weekends, the 12 p.m. to 1 p.m. slot is the best time. Usually, at these time and days, it is seen that the click, shares, comments, and likes rate increases. You may check the engagement data on various measurement tools or on the Facebook Page Insights to determine the best time to post on social media. Instagram is always accessed from the mobile device. So, does that mean people scroll through Insta handle after work hours? No, that’s not right. 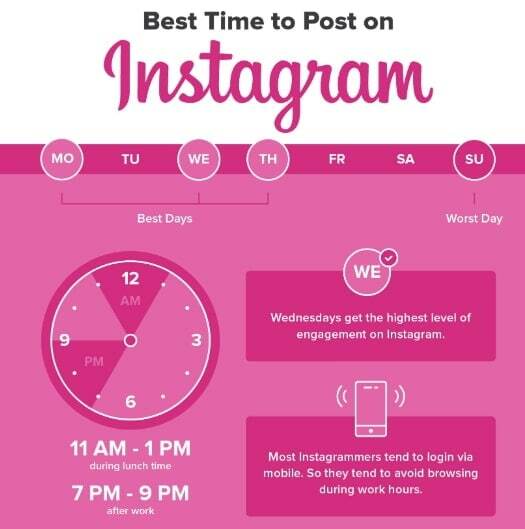 It is the time between 12 p.m. and 1 p.m. on the weekdays when people access their Instagram profile, the most. It is especially the time of access for the B2B brands. It may not be similar for all. If you are a B2C company, after work hours may be tested like the 7 p.m. slot through the weekend and weekdays. The social team at Instagram select the timing on the basis of user’s day to day activities on Instagram, how often do they check Insta, do the users check Instagram within work hours, while going for work or while returning, etc. Twitter is the best platform for small and attractive content which is enjoyed most during the break hours in the afternoon around 12 p.m. and after work hours that is around 5-6 p.m. Several studies have shown that the mid-noon hours is when the Twitter users actively engage with the Twitter content, the most. 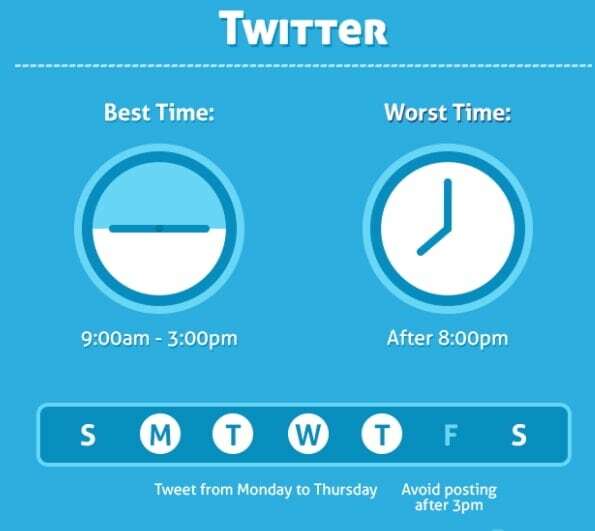 It also reveals that from Monday to Thursday is the best time to put up Twitter content. These days are especially beneficial for the B2B sector. Wednesday has the greatest number of click-through rates and re-tweets on Twitter. 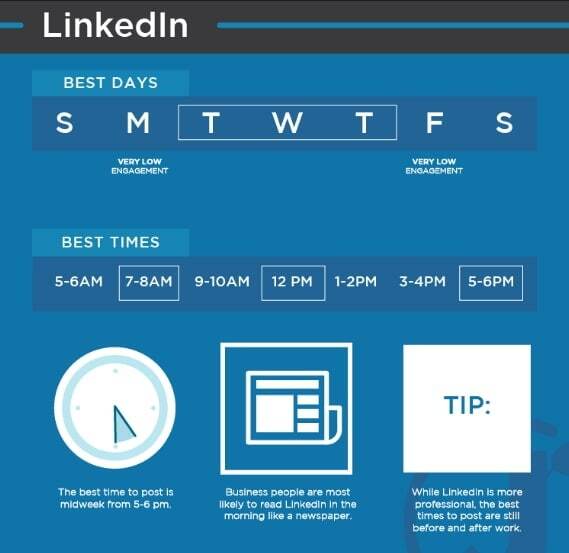 The users on LinkedIn are mostly active before and after work hours that is around 8 a.m. and between 5 p.m. to 6 p.m. respectively and during the lunch hours around 12 p.m.
You may not be active on LinkedIn and updating your profile after 5 years or changing your education details. Whatever it is, you are making the changes thinking about work or thinking to get a good job. So, you are not actually making the changes during your work hours. Usually, the LinkedIn feeds are usually checked on the weekdays that are around Tuesday, Wednesday, and Thursday. On Mondays and Fridays, the engagement of the users on LinkedIn is not adequate and people prefer to access LinkedIn on Weekdays instead of the weekend it seems. The reasons might differ from one user to the other, but as per the studies, the mid-week days are the best to focus on your LinkedIn content marketing strategy. 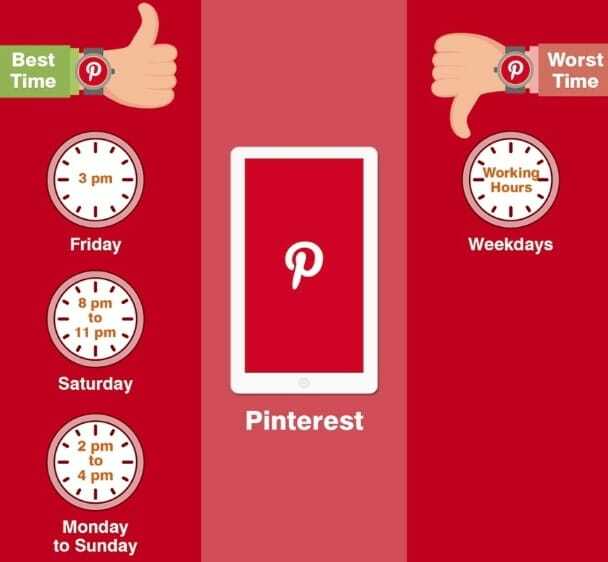 You may use Pinterest between 8 p.m. and 11 p.m. Pinterest is mostly used by the Mothers and that may be the reason why the late evening is chosen as the preferred time for the use of the platform. You may create post throughout the week but the weekends can be quite busy and posting during the work hours also won’t work on this platform. It may result in low engagement levels. You will agree with the fact that every industry has its own sets of audiences with varied lifestyles and social media habits. It is an important factor that can impact the best time to post on social media to a great extent. The brand has certain goals like the sale of products or lead generation and the post timing is based on all such major goals. A 2018 study reveals the generic best time to post on social media for the Non-profit, Education, Consumer goods, and Tech industries. Are you targeting multiple time zones at the same time to reach your business or customers? You may select two or more time zones and try to post during the peak engagement hours for effective results. For instance, if you target the Facebook consumers and want to reach them at the peak time in CST, EST, PST, and MST time zones at one go, scheduling the post at 4 pm EST can be right enough. If you do so, your post will reflect on people’s feeds at 3 PM CST, 2 PM MST, and 1 PM PST—all are ideal hours for posting. You may also target specific states in each time zones and create your ads with Facebook ads. For engaging with the users, there are no hard and fast rules. With every brand, their set of audiences differs. You may try the data shared above, but before you find the best time to post on social media, be observant, monitor and analyze to understand it yourself and get the best time to post in 2019.